Arogya Ayurvedic Health - The Gunas and Doshas in AyurvedaWhat Dosha are you? Click here to find out! 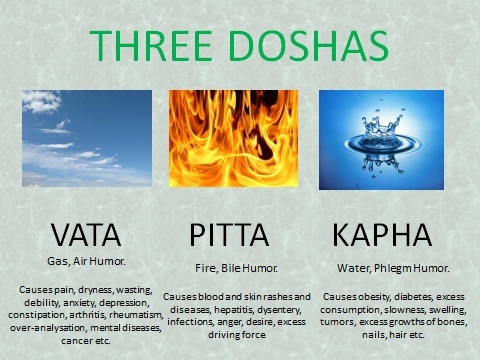 What Dosha are you? Click here to find out! The Gunas are Modes of Nature and the Doshas are the Three Humors in Ayurvedic medicine, both of which are important to each other. Generally, the deities that we can classify as Sattvic generally belong to the Bhakti or Devotion group of deities. Their devotees are hence in the mode of Bhakti or devotion. This connects to the Vedic god Soma, who represents love, devotion, emotion and divine bliss. Soma is also the Moon. Deities that we can classify as Rajasic, belong to the Firey nature of deities, or deities of action. These connect to those who practice yogic austerities (tapas, meaning heat), such as fasting, vows of silence etc. It connects to the Vedic god Agni or Fire, and hence fiery deities, such as Skanda, the Hindu god of war. Other deities that we can classify as Tamasic or Dark, are those generally associated with Black Magic (Abhichara), in forms of Vamamarga or the Left Hand Path in Hinduism. It is an occult path, where mystic powers are gained. Yet, Tamas also refers to a higher darkness or transcendence, that represents the Self, and hence connects to Vayu or Indra Vedic Gods of Wind or the Breath of Life (called Prana in Sanskrit). Kapha or Wind more likely to affect Bhakti or devotional types, such as devotees of gods such as Krishna or Vishnu, who represent the Moon (Soma) and Divine Love. So, those in the mode of Sattvas. It connects to Bhakti-Yoga, Yoga of Devotion. Pita or Fire more likely to affect the more austere (tapas) types, such as Himalayan Yogis, who practice austere yoga and chanting (mantra-yoga) for years on end. So, those in the modes of passion or action. It connects to Raja-Yoga or Yoga of Action, such as breathing control (pranayama) and yogic postures (asanas) etc. Vata or Wind is more likely to affect those who practice Self-Realisation or the Yoga of Wisdom or the Self (Jnana-Yoga or Atma-Yoga) or Black Magic (Abhichara) to more wrathful forms of the deities, that are more pranic or breath-like in nature, such as wrathful forms of the god Shiva and the Divine Mother (especially Kali, the black goddess, in her many fearful manifestations). Yet, an excess of any of these can also cause problems for the lay person. As Kapha is the waters, it also relates to the mind (manas), which is known in Hinduism to be a form of the liquid-god Soma, who is also the moon. It connections not only to devotion, but also to laziness, excessive sleep etc. which are connected with kapha-type mental disorders, that can be created by this guna or mode and dosha or humor. Pitta or Fire can cause tumors, since they are more of a fiery manifestation, and thus pitta or fire-related cancers can become common with those who practice severe austerities or tapas. As any form of tapas or austerities hence its name heat is associated wit such practices, such pitta or fiery conditions can arise. Likewise with those who practice excessive black magic or Self-Yoga through breathing exercises for more of an inner experience, as opposed to mystic powers (called siddhis), which is often the goal of Raja-Yoga. Therefore, a balance must be made, with the humors and modes of nature in regards to the deities. But, how, we may ask? Conditions arise only due to the excessive practices, causing excessive kapha (water), pitta (fire) or vata (wind) in the body. So, we must practice a little of each, in our path to the divine, and daily routine. For example, if we were to eat, say, only dairy products most of the time, which produce kapha (water) and did not balance it with pitta or fiery foods, such as spicy foods and wind-relate or vata foods, we would end up with a kapha or water condition, as there is an imbalance. The same also with pitta and vata type foods. Thus, in our own lifestyle, we can adapt our own practices, to allow the modes of nature or gunas, to balance our doshas or humors, so that there is not an imbalance. This may mean cultivating faith (shraddha) and bhakti (devotion) a bit more, if one is inclined to do just Raja-yoga or tapas (austerities). Or visavis. Or, if one worships deities with a strong vata-type nature, then try and supplement these practices with some tapas and bhakti or devotion. (Hover mouse over image below and click on "Zoom" logo to enlarge - RHS lower corner when hovering). To increase Kapha: Include bhakti or devotional deities, such as Krishna and Vishnu, along with their chants or mantras (sacred chants).Mantras to chats to the moon are also helpful. This also includes things such as puja or offerings of incense fruit, rice, sweetmeats and vegetarian foods to these deities. The Goddess Lalita, goddess of bliss and delight, also increase kapha, as can the Moon (Soma) and Venus, which are planets of a kapha-nature. Mantras such as Shrim, the Soma-mantra are useful. The Swadhishthana-Chakra or the Water-centre in the body, located in the region of the belly button, with the mantra Vam can also help, asit connects to these deities. To increase Pitta: Practice some Pranayama (breath control) and Mantra-Yoga or chants to more Fiery-deities, such as Skanda, the god of war and Bhairava, the form of Shiva connected to the Divine Inner Fire. The Goddess Bhairavi, the goddess of Fire and Tapas (Austerities) can also be worshipped to increase pitta, as can Mars, the Firey Planet. Mantras such as Hum, for inner Fire are helpful. The Manipura-Chakra or the Fire-centre in the body, located in the region just above the navel, with the mantra Ram can also help, as it connects to these deities of Fire. To increase Vata: Do some practices or worship to Vata-related deities, and some Atma-Dhyana, meaning Self Meditation or Contemplation, rather than Raja-Yoga which focuses on breaths. By stilling the breath and mind, we can reach the state of Vata or Vayu (Wind), connecting to Prana or the Breath of Life. Such deities are Self-realistion forms, such as the Great Goddess (Shakti or Power) in her many wrathful forms. Udanavayu or Up-Moving breath is extremely helpful to create Vata in the body. The Heart-centre or Hridaya-Chakra connects to Vata, and its mantra is Yam meaning To Control. It also connects to Yama, the god of death. Main forms are Kali and Chamunda, or the headless goddess Chinnamasta (known in Buddhist Tradition as the lightening-goddess Vajra-Varahi). Mantras to planets such as Saturn, the Dark Planet and also Rahu and Ketu, the nodes of the Moon are the best, as they also relate to the Goddess and to Prana or Breath and Wind. Mantras useful are Krim, Aim and Om, mantras of Inner Wisdom. Certain mantras can increase a balance of all three humors or doshas, such as Shrim (Mantra to Kapha or Moon), Hum (Mantra for the Fire or Pitta), Krim (Mantra for Wind or Vata), used in conjunction. Many mantras to the Goddess possess these powers. A is Brahma, the Creator and the Earth-region which is also Fire or Pitta Connects to Rajas or Action / Passion. U Is Vishnu, the Preserver and the Heavenly-region. Connects to Goodness or Truth and Purity. M is Shiva and the Self-region. Connects to the transcendental region and that of Darkness. A is Rajas and hence Pitta or Fire. The Primal and stimulating or agitating vowel, which brings into creation, the Cosmos. U is Kapha or Waters. The Blissful nature of the heavens that preserves and sustains, as such water-related humors as blood do. M is Vata or Wind. The Dark and transcendental state of the Self or Atman, that transcends all, and yet is also within all, as the formless quality of breath (prana) that pervades all beings and worlds. The mantra AUM can thus be used in extended chanted form, to balance the three humors, and our inner gunas or qualities. We can therefore see here, that the relationship of our temperaments or mental states also have a profound impact on our own body, and can cause an imbalance in the doshas or humors, causing such problems that create diseases and various other ailments. Therefore, we see the importance of our mind (manas), or rather, or our own inner being or Self (Atman), as the Divine Healer. Hence, Healing comes from within, as is the ancient Ayurvedic philosophy for thousands of years in India. We need to live a life that balances our inner temperaments, so they are not in excess, as therefore do not interfere with those humors that they connect to in our own bodies. Let our inner Self unfold and help us in our healing processes, so that we can be the Masters of our own Bodies!